For Bill, life was stable. As a truck driver for more than 30 years, Bill was married and had a house of his own in Santa Cruz. But once his divorce was finalized, the stability he was accustomed to vanished. In a short time, Bill lost everything and had nobody to turn to for help. With no knowledge of how to live life on the streets or where he could get help, he started using drugs. After six months at a shelter in Watsonville, he realized that he wasn’t getting the support he needed, and made his way back to Santa Cruz, setting up camp along the river. After a year of riverside camping, someone informed Bill about the resources at Homeless Services Center. 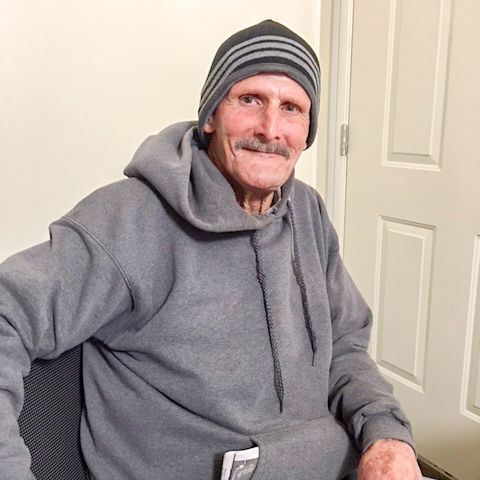 At HSC, Bill was able to take showers, receive mail and get something to eat. He was able to socialize with others experiencing similar difficulties and learn of resources that were available throughout Santa Cruz. Bill successfully applied for disability (SSDI) and was able to obtain a bed in the Paul Lee Loft. Even though Bill had a roof over his head, Bill was still struggling with addiction, and found himself in and out of shelters and camping on the streets. Persistent as always, Bill renewed his efforts to find support at HSC and also at Homeless Persons Health Project. With the help of his case manager, Bill applied for a Section 8 voucher. After a long five-year wait, he received his voucher, and found housing for two years, at which point his apartment complex stopped accepting vouchers, and Bill was forced to move out. In the midst of the move, Bill was diagnosed with prostate cancer. Today, Bill lives in his own apartment in Santa Cruz, has been clean from drug use for over a year, and his prostate cancer is currently in remission.